Sore throats are known to happen at any time of the year for number of reasons. It is not that it can happen only during cold seasons. A sore throat is essentially an irritation, scratchiness or you can say a pain of the throat that frequently worsens when swallowing. There are different essential oils which can assist to make a sore throat go away rapidly. Here we describe some best essential oils for sore throat relief let us read to know how to use and its benefits. What Essential oils are Good for Sore Throat? 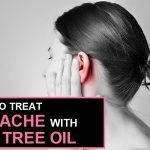 How to Cure Sore Throat with Essential Oils? Essential oils are considered as an alternative remedy for sore throat. There are many studies that have demonstrated that several essential oils have anti-inflammatory, antibacterial, and antiviral properties. You can mix few drops of any of the listed essential oils with warm water, and then spit. You can also inhale the mixture. Alternatively, you can add few drops of essential oil to carrier oil and then massage he mixture to the area around throat. For a sore throat, gargling few drops of this oil with hot water can be highly beneficial. Add 4-5 drops of this oil to 1 glass of warm water. Now try to gargle the mixture and then spit. This essential oil possesses anti-inflammatory, antibacterial, and antiviral properties which are capable to cure soreness of throat. It is extracted from natural plant, so the oil functions effectively to relieve throat soreness. Repetitions: Twice or thrice a day. Best time to apply: During morning. Tips: Make sure to use it sparingly and never swallow. Presently, oil extracted from the eucalyptus tree is seen in many over-the-counter cough and cold products in order to relieve congestion. Initially add one drop of eucalyptus oil to one teaspoon of carrier oil such as almond oil, coconut oil, or olive oil. Now massage the oil over the throat and above the lymph nodes as well as towards the down sides of the throat. The health benefits of this oil are because of its capability to encourage immunity, offer antioxidant protection and enhance respiratory circulation. The oil functions to break up mucus and phlegm and decrease congestion. Best time to apply: At any time of day. Tips: Make sure to massage the oil softly over the throat. Clove essential oil is helpful for boosting the immune system; hence it is very useful at off-putting and relieving condition of sore throat. First dilute 5 drops of clove oil with 1 teaspoon of olive oil. Now gargle mixture for about one to two minutes. Lastly rinse your mouth with water. The sore throat advantages of clove oil can be credited to its antifungal, antimicrobial, antiviral, antiseptic, anti-inflammatory and stimulating properties. Besides, clove possesses natural warmness to few extent which works to heal the soreness of throat. Repetitions: Twice a day for one week. Best time to apply: During night. Tips: Make sure you do not have allergies to cloves. Peppermint oil is typically utilized for treatment of cough respiratory infections, and inflammation of the throat and mouth, including sore throats. Initially combine three drops of peppermint oil and one teaspoon of almond oil. Now apply a few drops of this oil mixture on the affected throat area. Just leave it on for several minutes. Lastly wipe it off using a clean towel. 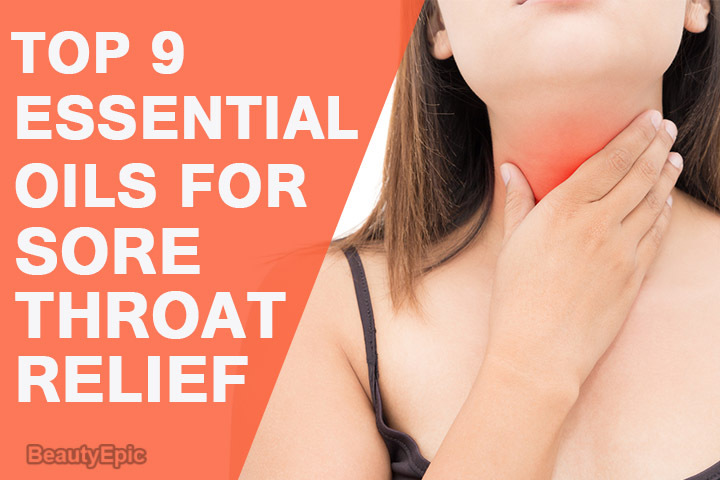 Research suggests that the antimicrobial, antioxidant, and decongestant properties of this essential oil function to alleviate your sore throat. Besides, the oil contains menthol which assists to sooth and calm sore throats along with thin mucus and break up coughs. Repetitions: Three or four times a day for one week. Tips: Make sure that you dilute the oil first in carrier oil because it can lead to skin irritation when utilized in pure form. The Thieves oil supports the immune system as well as supports healthy lung and sinus function. Initially diffuse 4-5 drops of Thieves oil inside a diffuser or vaporizer for three times a day. How it works: This oil function to relieves pain and reduce inflammation, by treating the underlying virus or bacterial infection which leads to the sore throat. Tips: Keep this oil away from reach of kids under age of two. 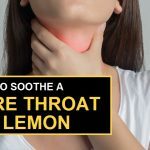 Lemon essential oil is recognized for its capability to cleanse toxins from any portion of the body and is extensively applied to stimulate lymph drainage, thus relieving soreness of throat. Stir 5 drops of lemon oil in 1 glass of warm water. Drink concoction for one time a day for three days. Lemon essential oil is known to be derived from the skin of the lemon and it is perfect for sore throats due to its anti-inflammatory and antibacterial properties. The oil is high in vitamin C which helps to enhance salivation and let your throat to stay moist. Repetitions: Once a day for three days. Best time to apply: Before going to sleep. Tips: Make sure to use warm water only. Coconut oil is considered as perfect oil for treating soreness of throat due to its healing properties. First combine 3 tablespoons of fresh squeezed lemon juice. ¼ cup of raw honey and 2 tablespoons of coconut oil. Mix these ingredients well in a small saucepan and heat them on low heat. Now drink the warm syrup using a spoon or combine it in warm water or tea and allow the healing to start. How it works: The oil includes antioxidants that excite tissue repair. Besides, it functions to quicken the throat recovery, reduce inflammation, and relieve soreness of throat. Tips: You can directly melt coconut oil inside tea or vegetable broth to remove soreness in your throat. Make sure, you only need to melt the ingredients, and not cook them. The anti-inflammatory components present in Olive oil are known to soothe the pain and inflammation occurring inside the throat. Take one measuring cup, and in that mix 1/4 cup lemon juice with 1/4 cup of honey. Now carefully warm 1/2 a cup of olive oil, inside the microwave, for not more than 5 seconds. How it works: Homemade sore throat/cough remedies, containing olive oil are highly effective because when swallowed olive oil coats the sore throat, instantly soothing the dry itchiness, which is often responsible for the accompanying cough. Repetitions: Take one tablespoon of this mixture every two or three hours. Tips: Make sure oil is not very hot before mixing with the lemon and honey mixture. This popular herb in oil form is considered as a smart choice for seeking protection against a sore throat. First combine 3 drops of Oregano oil and 1 teaspoon of Olive oil. Now gargle the mixture for one minute. Lastly, spit it out and gargle warm water. There is scientific evidence that this oil possesses anti fungal and antiviral properties. These properties function to cure parasite infections, thus curing soreness of throat. Repetitions: Twice a day for four to five days. Tips: At the end, make sure to gargle the warm water. Different people have different level of allergies and infections of throat soreness as it can be due to infections or coldness of weather. Using any of these oils can function to relieve soreness of throat in less time. How to Get Rid of a Sore Throat Naturally? 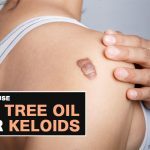 How to Use Tea Tree Oil for Keloids?